The trouble with The Trouble with Physics is that it is, in fact, two books for the price of one. Each of these “sub-books” presents a different issue. The two issues are not in conflict, and they are certainly related, but each deserves its own discussion. The first issue, presented in the first three parts of the book, is the trouble with string theory, and why Smolin -- a theoretical physicist -- believes it to be utterly wrong. 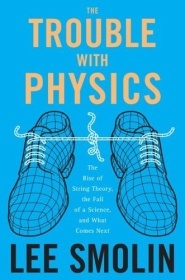 The second issue, presented in the fourth and last part of the book, is that string theory research seems to be smothering other kinds of research in physics, especially in theoretical physics. And while I think it is the second issue that bothers Smolin the most, it seems like most reviewers focused on the first, and more technical, issue. The book begins with an overview and history of physical research up to and including the rise of string theory. This part is a bit too long, but generally well-written. (Hurray for Smolin for not bothering the readers with needless explanations about each technical term -- he actually assumes the reader is an educated person, which is a refreshing approach). At times, it is very exciting; for example, it is easy to share the writer’s thrill when the SU(5) theory is outlined, and share his disappointment when its failure under experiment is described. Smolin actually makes the reader enthusiastic about string theory, when it is first presented. And then we journey with the author from enthusiasm to disappointment as we delve into string theory’s development over time. Apparently, string theory is not “background independent”, which implies that it is incompatible with general relativity. Yet according to Smolin, string theory’s main limitation is the lack of predictive power. The theory makes no predictions, and thus cannot be falsified; in fact, it encompasses an astronomical number of theories, and each experiment can be explained by some variant from this vast landscape. String theorists, when presented with this criticism, ended up labeling those who demand falsifiability “Popperazzi”, after philosopher of science Karl Popper. Next, Smolin presents some alternatives to string theory, approaches preferred by “heretics” like himself. He naturally focuses on those theories that he himself was involved in, such as loop quantum gravity and doubly-special relativity (DSR). While he naturally believes that these theories hold the key to the true description of the physical universe (and string theory is wrong), Smolin admits that he could be mistaken: the “right” theory could be string theory, or it could be some other theory, possibly one that nobody thought of yet. What he laments is that the converse does not seem to be true: string theorists seem to him unable to conceive the possibility that string theory is simply wrong. This is the focus of the last part of the book, which presents the second, and more important, issue that Smolin is trying to press. And thus, Part IV of The Trouble with Physics is -- as noted above -- a book in its own right, one that might have found a wider audience if it was detached from the first three parts. It is more about sociology than about physics: the sociology of the community of theoretical physicists. And when physical research makes many strides forward, and Parts I to III will be hopelessly outdated, Part IV of the book will still remain relevant. When studying the sociology of the community, Smolin accuses string theorists of groupthink. This groupthink, he claims, prevents them from even admitting the possibility that their favorite theory is wrong. They’re even accused of having a “messianic tendency”; for some (mostly younger) members of the community, string theory had become a religion, with figures like Ed Witten in the role of prophets. To the believers, those who suggest that string theory is wrong are heretics. At a recent string theory conference, an editor from Cambridge University Press confided to me that a string theorist had told him he would never consider publishing with the press because it had put out a book on loop quantum gravity. This kind of things is not as rare as it should be. At times, Smolin’s claims sound like whining. But the accusations he makes are serious, and must be taken seriously. I’m not sure about his suggested solutions, though. For example, Smolin accuses the physics community with “blatant prejudice” against women and blacks. “Anyone who has served, as I have, on decades of hiring committees and hasn't seen naked prejudice in action is either blind to it or dishonest,” he states (p. 336). He believes affirmative action is the right solution for this prejudice, which could be true; but then he moves on to suggest using affirmative action to help hire “people who just think differently,” an idea which I personally find somewhat pathetic. So, what comes next? How can the physics community heal itself, and pull itself out of the hole it has dug? A string theorist could claim there’s nothing to heal, and Smolin is merely lamenting the unpopularity of his own pet theories. But I disagree; this reader, at least, was convinced by Smolin’s argument that there really is a trouble with physics. We'll probably have to look for a solution elsewhere, but acknowledging the problem is an important first step.